This Twinchy is of ornaments hanging on a tree. I made a stocking of it with much larger ornaments, all in blackwork on dyed canvas, but I wanted something simpler, easier, and faster. It uses another technique to make differently colored areas. I began by using a quarter to trace out the ornament shapes, making sure they overlapped. Then I stitched in background in Encroached Gobelin using Gumnuts Blossoms. The soft shading of this wool allows the ornaments to stand out. 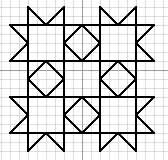 Each ornament is stitched in a different Blackwork pattern (pictured above). You can click on the picture to get a full size chart for all four. All but the pink and blue one are stitched in Kreinik metallic. The remaining one is stitched in an Anchor peal with metallic from my scrap bag. Once the ornaments were stitched I felt it looked a bit abstract. So, for a finishing touch I stitched some bunches of random Diagonal Gobelins to be the bunches of pine needles, covering the edges of the ornaments. This was the perfect touch, making the whole thing look life-like. This first Twinchy is called Snowflakes and it uses an easy overstitching technique to do Blackwork on needlepoint canvas. I began by coloring the background blue (or you could use blue canvas but I didn’t have any). Then I stitched T Stitch over the entire area using one strand of Impressions. Over this, using white (100HL) Kreinik metallic, I made snowflakes in Blackwork. None are centered and they overlap. The charts for the snowflakes will be available around Jan 12, once I get the manual I need unpacked. Last, but not least, is this unassuming Twinchy. It will be finished with a wired ribbon bow and will look like a real package. I divided the Twinchy into quadrants and stitched a ribbon down the center. Notice how the ribbon “overlaps” to look realistic. The rest of the Twinchy is stitched in Jacquard using Very Velvet for the Byzantine and metallic for the Tent Stitches. This is a really simple Twinchy to do, just use any stitch and thread combination you like. These three Twinchies give you lots of ways to exercise your creativity.